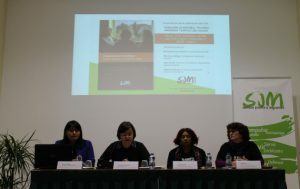 The Servicio Jesuita a Migrantes (Jesuit Migrant Service) (SJM) presented this past 13th November the ‘‘Visibilizar lo Invisible’, Mujeres Migradas y empleo del hogar’ (‘Make the Invisible Visible’, Migrant Women and household employment) report. The report is based on a detailed look at the reality of women in domestic work and female care workers, leading to the recognition of these women’s fight for decent working conditions. They suffer a myriad of discrimination, resulting from contempt and lack of recognition in a society that has normalised this type of situation. The huge inequality of domestic workers’ rights amplifies the instances of rights violations against female workers. Based on the in-depth study of situations accompanied by SJM member organisations in Bilbao (Fundación Social Ignacio Ellacuría), Madrid (Centro Pueblos Unidos-Fundación San Juan del Castillo), Seville (Asosiación Claver), Valencia (SJM Valencia) and Valladolid (Red Incola), the report aims to identify rights violations against female domestic and care workers; to reveal the injustices these women must suffer; and to highlight the organisational and denunciation efforts the women make themselves to improve their situation and exercise their citizenship. Likewise, an effort has been made to review the role of social organisations and identify best practices to protect against instances of rights violations and to stand with the struggles and demands of women in household employment. Within the framework of the study, the following have been identified: the high prevalence of informal labour (almost half of the women interviewed were not registered with Social Security and over half do not have a written contract); the systematic violation of workers’ rights (70% of the women surveyed are not paid for the hours they’re at work and do tasks for which they were not initially hired); and exploitative situations, which are particularly serious in the case of in-house trained household workers. In this case, most of the internal workers interviewed worked more than 12 hours a day without rest, nor recognition of holidays, public holidays, nor with hours of rest between working days or at weekends. More concerning still is that a third of the women interviewed reported having suffered workplace bullying, violence, harassment, or sexual abuse. The SJM believes it is fundamental to mobilise different social and political actors to find a common understanding and build consensuses that do not toy with people’s dignity and that guarantee the protection and full rights of domestic workers. For this reason, we want our politicians to commit to this cause at Visibles.org and to 8 white lines they believe to be essential in the fight to dignify household and care work.